Despite the advancement in storage devices, such as the external hard disks, thumb drives, CDs, DVDs, and Blu-ray discs are some of the safest places to store all your crucial information. This is one of the reasons that companies are continually developing burning software. Among the best software is Free Burning Studio. Let us now look at what is in store for you once you download this one of a kind software. A fast and easy software, it has received customer as well as critical acclaim and voted as the number one free disc burner software in the world. It allows you to burn video, data, and audio files to a CD, DVD, or Blu-ray disc of your choice. It is free for download from the developer’s site www.disc-maker.net let us look at what you can expect when you download it. 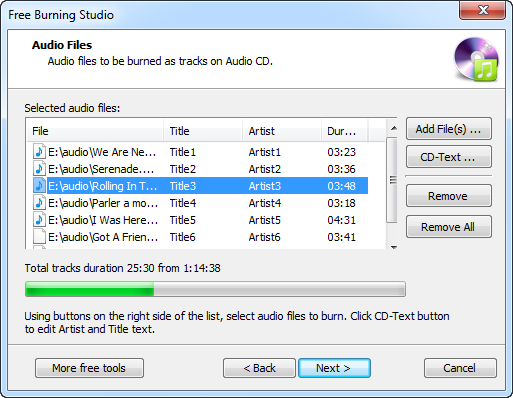 Unlike other burning software, Free Burning Studio allows you to explore the heights of creativity by enabling you to create an audio CD/DVD/Blu-ray from audio and video files in a variety of formats. This includes WAV, MP3, WMA, and many more formats, to suit your moods at any given time. Burning all your audio and videos files into discs allows you to listen and watch the fruits of your creativity from anywhere in the world, at a time of your convenience. Videos are becoming the best way to spread information; Free Burning Studio helps you to combine different video clips into a movie and burn it onto a CD, Blu-ray disc, or a DVD. It supports some of the most popular video formats including MOV, MP4, MPEG, as well as convert DivX to VCD, SVCD, or DVD-video. Best of all, it allows maintains the quality of the videos making it easier to watch the new DVD, CD, or Blu-ray on your work computer, home DVD players or your portable DVD player. You can also upgrade the quality of the result into HD, FHD quality for DVDs and Blu-ray discs for a pleasant viewing experience. With malicious hackers exploiting every avenue to spread ransomware, it would be unfortunate when you lose all your data from your computer. They target all devices connected to the internet, but you can ensure that your data is safe from their antics by burning it into discs. Free Burning Studio makes the process easy. All types of data, for example, ISO images, text, PDFs, audio and videos, HTML files, can be burned onto a disc such as CD-R, DVD-RW, DVD+R, DVD+RW, CD-RW, Blu-ray for distribution and safe keeping. An ISO file is a single file containing all file and folders from a DVDs/Blu-ray discs/CDs. Free Studio Burner comes with in-built ISO tools to create, edit, rip, as well as burn the ISO files and images. Storing your data, audio, and videos, uses up less disc space and you can burn as many ISO file onto a single disc, given the amount of space it has. In conclusion, the Free Studio Burner provides you with a one-stop solution for authoring your discs. It holds the number one spot for its ease of use, and it is safe and free.